The writing staff here at Green Global Travel has been a fortunate group of ramblers, exploring a bevy of the biggest and tallest mountains in the world. From Alaska’s Denali/Mt. McKinley and Tanzania’s Mt. Kilimanjaro to the Andes mountains of South America and the Himalayan region around Ladakh, India, every continent has its most formidable and majestic peaks. Collectively known as the Seven Summits, these massive mountains have inspired adrenaline-fueled adventurers for more than a century now. Even ecotourism enthusiasts like us (who have ZERO interest in climbing Mt. Everest or K2) are drawn to the mountains. We love to explore hiking trails, visit mountain gorillas, climb glaciers, or simply watch the leaves change colors in the autumn season. Perhaps that explains why we’re constantly dreaming of visiting the countless other mountains on our bucket list, and revisiting a few of our past favorites. To that end, we’ve compiled a list of 20 of the tallest mountains in the world, broken down by continent. But this isn’t just about size. Though you will find each continent’s biggest mountains included here, we’ve also scoured the globe for other notable conquests of enormity. We’ve featured volcanic mountains, the largest mountain ranges, and pretty much any potent peak that strikes us as formidable. So why not take a virtual hike (or climb, if you prefer) around the world with us? Visit the GGT Facebook page to leave a comment about your own mountain adventures, and let us know of any other great goliaths we’ve left off the list! 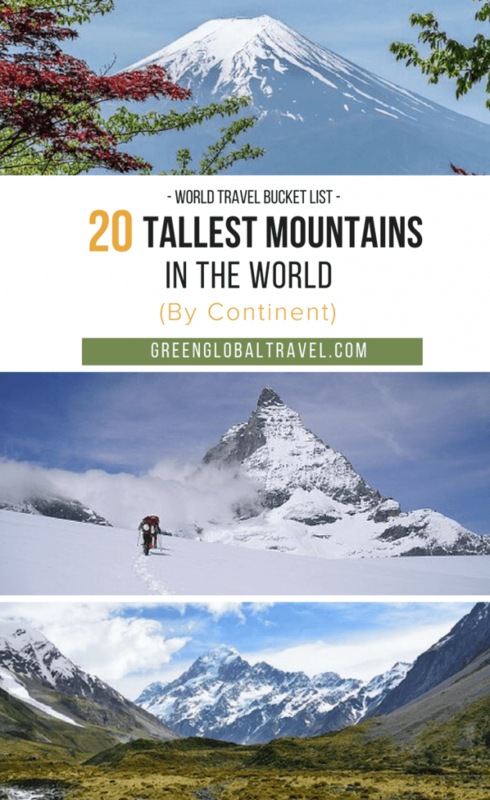 If this list were purely based on the world’s 25 tallest mountains, then we wouldn’t even make it out of this iconic Asian range. The Himalayas stretch around 1,500 miles, from Pakistan and India east to China, Nepal, and Bhutan. These mountains aren’t just skyscrapers; they are like earthly divinities of the skies. Mount Everest, which towers at a whopping 29,029 feet above sea level, is the world’s tallest (and arguably most deadly) mountain. 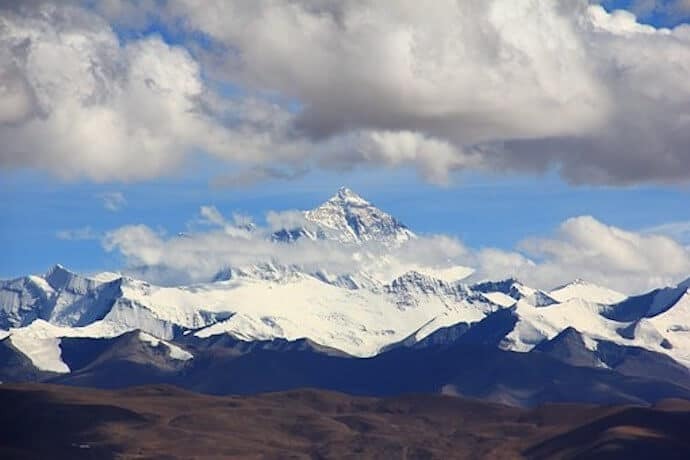 In the Tibetan language, it is referred to as the “Goddess Mother of the World.” Its jagged peaks represent the border between Nepal and the autonomous region of China recognized as Tibet. It is the highest mountain in the world. The world’s second tallest mountain, K2, reaches an equally absurd 28,251 feet. From there, 35 other mountains in the Himalayas stretch above the 25,000-foot threshold. No other mountain on the planet gets anywhere near that high. With such gargantuan company in the area, one would be hard-pressed not to be in awe of what a couple of tectonic plates can come up with when they meet. Beyond risking life and limb to summit Mount Everest and K2, there are lots of more doable treks to be found in the Himalayas. The most famous is the 131-mile Annapurna Circuit, which draws seriously hardy hikers to the area every year. It is worth noting that five of the world’s ten most dangerous treks, including Annapurna, are located in this mountain range. When you’re talking about the world’s biggest mountains, Iran is probably not the first place that usually comes to mind. But Mount Damavand, which stands at 18,600 feet high, is both the tallest mountain in the Middle East and the second highest volcano in all of Asia. It is also the world’s 12th most prominent peak when measuring from lowest bottom to tippy top. All that, and it remains a potentially active volcano! This majestic mountain is steeped in history and features prominently throughout Persian mythology. 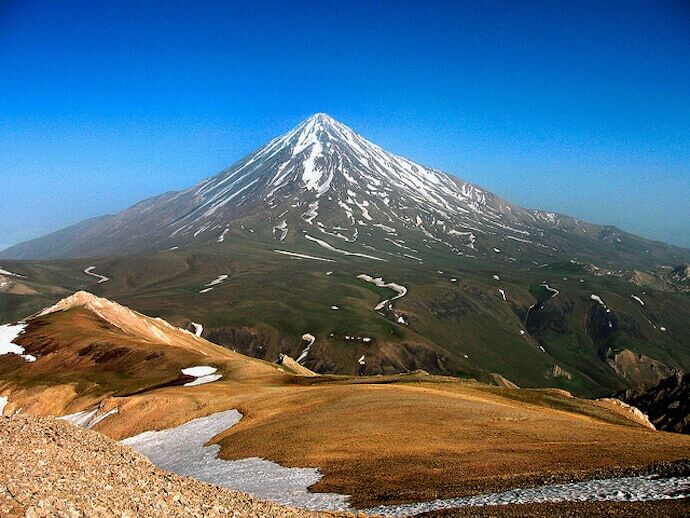 According to legend, Mount Damavand is home to a three-headed dragon and is wrought with magical powers. In more practical, modern terms, it is featured on the 10,000 Iranian rials banknote. Mount Damavand (as well some others featured on this tallest mountain list) is one of the Volcanic Seven Summits, denoting the tallest volcanoes on each continent and representing a challenge of distinction for mountaineers. Although the mountain is little known outside of Iran, there are several tour companies that offer guided ascents up Damavand. Mount Kinabalu is part of Kinabalu Park, a protected UNESCO World Heritage Site located in Sabah, Borneo. It is the highest point between the peaks of the Himalayas and New Guinea. This Malaysian mountain is part of the Crocker Range, a collection of peaks that are renowned for their botanical and biological diversity. Mount Kinabalu is home to around 6,000 different plants, including rhododendrons, orchids (about 1200 species! ), chestnut trees, figs, mosses, ferns, and the world’s largest Rjah Brooke’s pitcher plant. 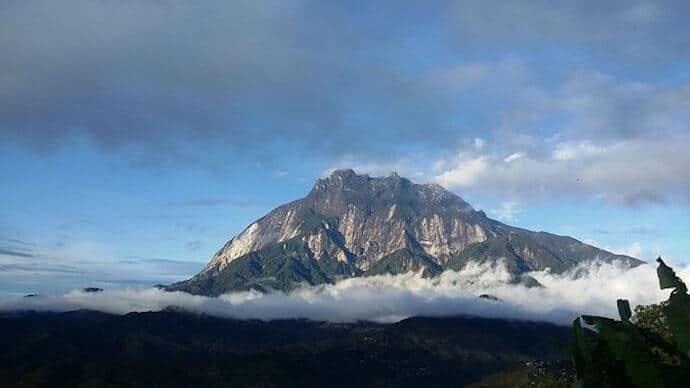 Though Kinabalu extends over 13,400 feet high and its name translates as “the revered place of the dead,” it is noted as one of the more reachable peaks on this list to summit. A typical climber can get it done in just a couple of days. This leaves plenty of time to explore the amazing park, which is home to over 300 species of birds, 100 species of animals, and 100 species of snails. These include weird animals such as the 20-inch Kinabalu giant red leech, a rare species of red leaf monkey, and the black and gold cicada. Despite its behemoth size, Mount Kinabalu is amongst the world’s most youthful batholiths (only about 10 million years old). Batholiths are a mass of igneous rock, spanning at least 40 square miles, that has solidified under the earth’s surface. Though not technically one of the tallest mountains in the world, Mt. 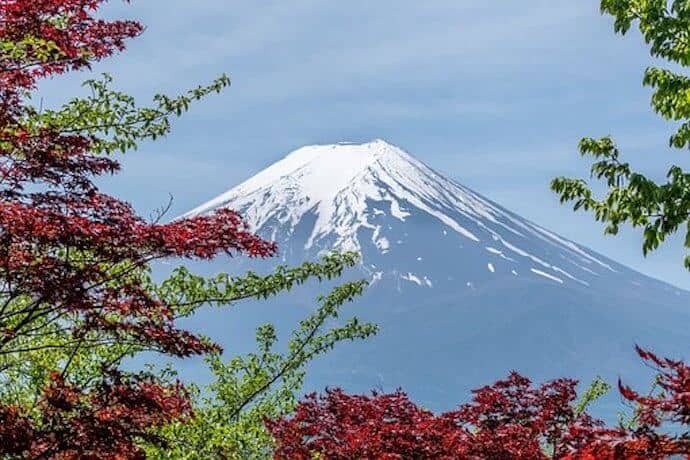 Fuji is the tallest mountain in Japan, measuring in at just under 12,400 feet. It’s also one of the planet’s most recognizable mountains. Mount Fuji is a stratovolcano– a composite cone caused by a series of serious eruptions that leave behind layers of rock, ash, and lava. More notable, the volcano is still active and sits atop a junction of three tectonic plates. Beyond the rocks, though, Mt. Fuji has become much more than a statistic of the Japanese landscape. It’s the most visited tourist site in all of Japan, with more 200,000 climbers ascending its summit annually. Uniquely, people usually begin their ascent at night in order to witness sunrise from the summit, which has its own special moniker: Goraiko. But the mountain is more than a tourist site, as well. It’s considered sacred in the ancient practice of Shinto, and has an impressive collection of shrines around its base. Located about 60 miles for the capital city of Tokyo, Mount Fuji ranks among the most recognizable symbols of Japan’s beauty. Outside of the gigantic mountains of the Himalayas, South America’s Mount Aconcagua (which is located Argentina, near the border with Chile) is the highest peak in the world, scaling heights of 22,837 feet. 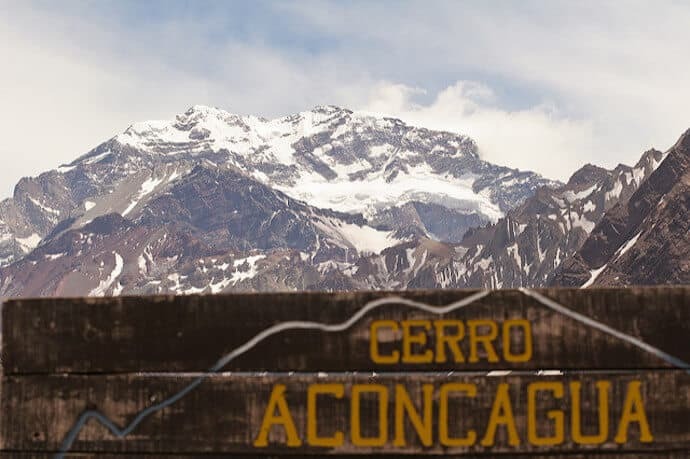 Aconcagua originally began its life as a volcano, part of the incredible Andes Mountains. Then, around eight to ten million years ago, shifting tectonic plates lifted the mountain up from its volcanic roots and added even more vertical prominence. Due to its departure from volcanism, Aconcagua is not included in the Volcanic Seven Summits. However, it is part of the even loftier Seven Summits, which denote the highest peaks on each continent. It’s considered the highest non-technical mountain in the world, since the commonly used northern route does not absolutely require ropes, axes, and pins. The use of supplemental oxygen is not common here, but that’s not to suggest that the mountain is not dangerous. Less than half of all climbers successfully reach Aconcagua’s summit, and five people died during the attempt in 2009 alone. Despite being much smaller than the Himalayas, the difficult climatic conditions of Aconcagua often put it into the same category of “eight thousanders” (mountains over 8,000 meters). The mountain is frigid enough to be covered with several glaciers, one of which stretches over six miles long. 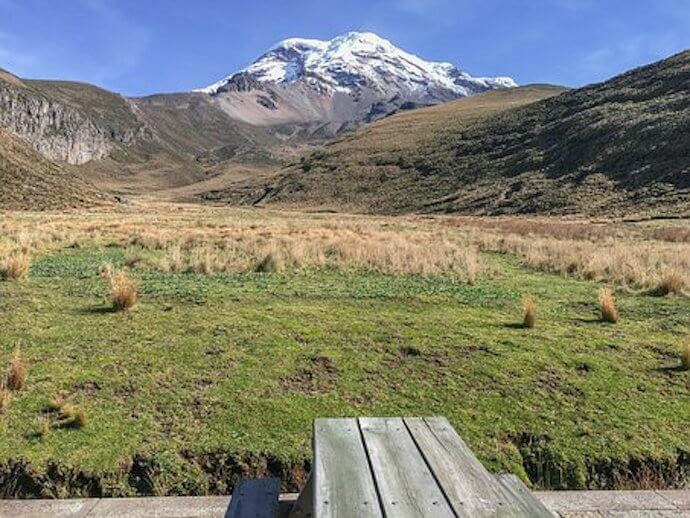 Measuring just a few hundred feet short of 20,000, Chimborazo (part of the Andes range) is yet another stratovolcano to add to our must-see list of highest mountains in the world. Chimborazo is believed to be inactive, with the last eruption occurring nearly 1500 years ago. It is the highest mountain in Ecuador, a country that’s known for its elevation. Quito (located at 9,350 feet above sea level) is second only to La Paz, the capital of Bolivia, for highest capital city in South America. Chimborazo is particularly interesting because, due to its location in the equatorial bulge, its summit is the furthest place on earth from the center, as well as the closest place on earth to the moon. From a purely technical standpoint, this makes it the highest place on earth, rather than Mount Everest! Despite being located near the equator, at a latitude of one degree, Chimborazo gets surprisingly cold. In fact, the entire top portion of the mountain is capped in glaciers. The glaciers’ meltwater supplies fresh water for two provinces in Ecuador, and the ice is mined to be sold and shipped to coastal towns throughout the country. Venezuela is perhaps best known among travelers home to the world’s tallest waterfall, Angel Falls, which measures over 3,200 feet high. But the tallest mountain in Venezuela dwarfs that, rising over five times the elevation of the famous falls. Measuring 16,332 feet, Pico Bolivar is located in the Sierra Nevada National Park amongst several other prominent peaks. The mountain was named in honor of the country’s national independence hero, Simon Bolivar. With a summit that is perpetually covered in snow and three glaciers, Pico Bolivar makes for an uncomfortably chilly climb. Fortunately, it’s possible for visitors to take the Merida Cable Car much of the way up the mountain, to Pico Espejo, which only a few hundred feet below the ultimate peak. At the time of its construction, it was the highest (and longest) cable car in the world. Unfortunately, due to its current crisis, Venezuela is not an optimal place to visit at the moment. But this mountain should definitely make your bucket list for the future. It’s one of the country’s finest natural attractions, alongside that fine waterfall, beautiful beaches, and wonderfully welcoming people. The tallest mountain in the US and all of North America was originally known as Denali, then Mount McKinley. In 2015, about a century after the switch, President Obama officially renamed the mountain to what Alaska’s Native population had called it all along. 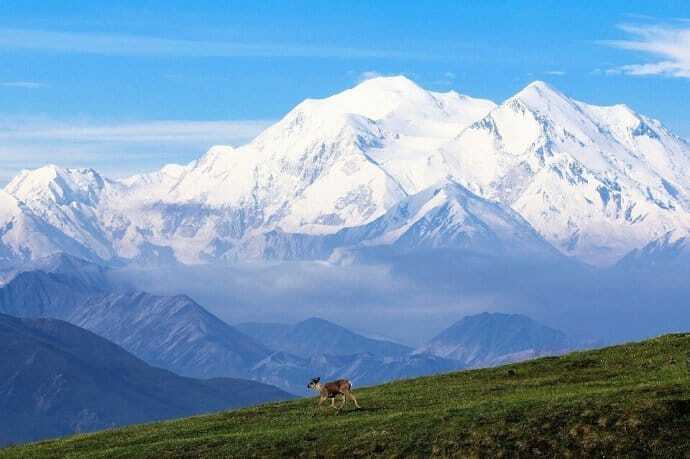 Denali, which means “the high one,” was named thusly because of its imposing, 20,310-foot stature. Often obscured by clouds (because it creates its own weather systems), Denali is the centerpiece of Denali National Park and Reserve. The mountain has also been central to the Koyukon Athabascans’ story of creation for over a millennium. The McKinley name was given to the mount by a gold prospector in 1896. It was named after future President William McKinley of Ohio, who was still but a candidate at the time. So it made less sense as a name for the jaw-dropping landmark on many levels. After Asia’s Mount Everest and South America’s Aconcagua, Denali is the third most prominent and most isolated peak in the world. It is also the northernmost mountain on earth to surpass 20,000 feet. Unsurprisingly, Denali has several glaciers on its slopes and is infamous for its weather extremes, regularly dipping below -100 degrees Fahrenheit at 15,000 feet. The tallest mountain in Mexico is a stratovolcano that tops 18,500 feet. Though it has not erupted since the late 1800s, Pico de Orizaba is considered dormant rather than extinct. It’s only the third tallest mountain in North America, but it’s the tallest volcano. In fact, it is the second most prominent volcanic peak on earth after Mount Kilimanjaro. 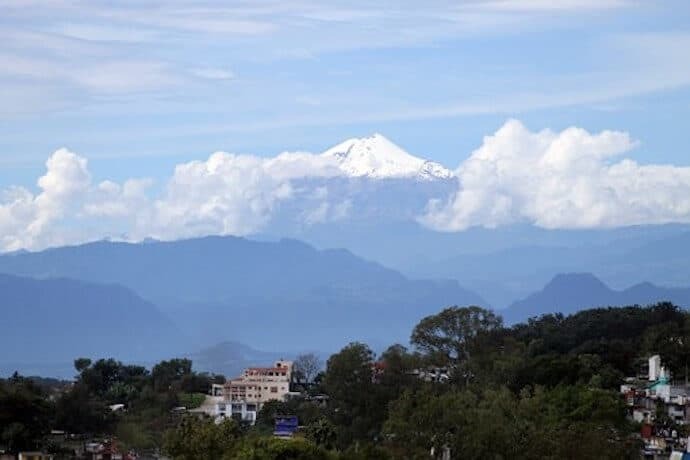 Pico de Orizaba stands beside the city of Orizaba, from which it gets its current name. 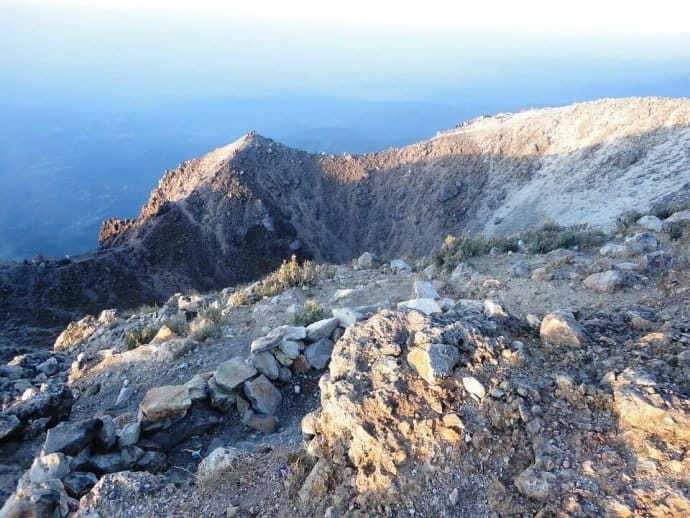 It was also called Citlaltépetl (“Star Mountain”) by native Nahuati speakers when the Spanish arrived, but they now refer to it as Istaktepetl (“White Mountain”) due to its snow-capped peak. Amazingly, it is one of three volcanoes in Mexico that currently maintain glaciers. Because of the drastic change in elevation and dominant winds, Pico de Orizaba has several different microclimates. It moves from being tropical at lower elevations of the eastern face to alpine tundra above the 14,100-foot mark. Up on the summit, blizzards are not uncommon. Then the snow melts on the south side, where the sun shines, and remains frozen on the north. Continuing down the North American continent to Guatemala, Volcan Tajumulco is Central America’s tallest mountain and volcano at nearly 14,000 feet high. Actually, the current volcano is believed to rest atop an older volcano. From its summit, climbers can see into Mexico as well as all the way to the Pacific Ocean. Volcan Tajumulco is part of the Sierra Madre de Chiapas range (part of the American Cordillera chain), which stretches from southern Mexico to Guatemala. The nearest city is San Marcos, which is about nine miles away, but most ascents begin from the tiny hamlet of Tuichán. From there, Tajumulco can usually be climbed in about five hours, and tours are offered by a slew of different tour companies catering to various budget levels. The best time to visit Tajumulco is in the dry season, which lasts from November through April, because the mountain’s stunning views can be concealed by mist and clouds during the rainy part of the year. Guatemala actually has 30 volcanoes, many of which can be visited and/or climbed. Moving off the North American mainland, Mauna Kea of Hawaii is a towering peak looming over the volcano-laden Pacific. At just over 13,800 feet, it is the tallest mountain in Hawaii, and the second highest island peak in the world. Mauna Kea (the “white mountain”) has a rich place in indigenous Hawaiian Mythology. The dormant volcano is believed to be home to the snow goddess Poli’ahu, who is revered for her power and beauty but said to have a cold heart. She shows her softer side on the sun-kissed cliffs of Hamakua, where winding streams and waterfalls lead to the sea. It was here that Poli’ahu and her sister Lilinoe (goddess of the mists) took off their snow cloaks to challenge chiefs to a sledding contest, only to be confronted by the fiery jealousy of Pele. Interestingly, Mauna Kea’s height is only calculated by what’s above the water. If measured down to its base on the ocean floor, it’s actually 33,000 feet tall– nearly 4,000 feet taller than Mount Everest! In other words, most of this beast is underwater. Mauna Kea hasn’t erupted in at least 4,000 years, which seems a long time until realizing that the volcano is thought to be over a million years old. 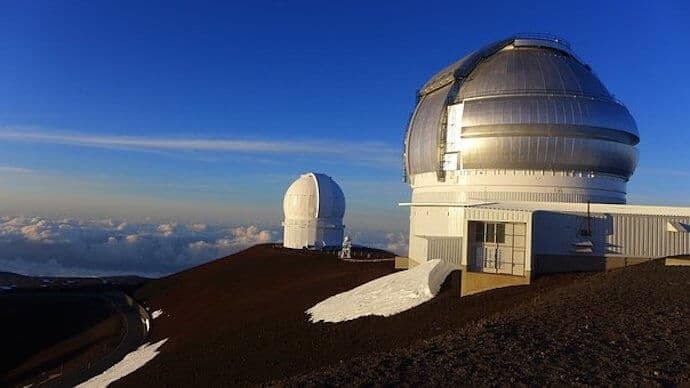 Besides being an awesome mountain, Mauna Kea has become famous for having the world’s biggest astronomical observatory at its summit. The dry conditions at its peak help with observation of the night sky, as does the fact that it is typically above the cloud line. 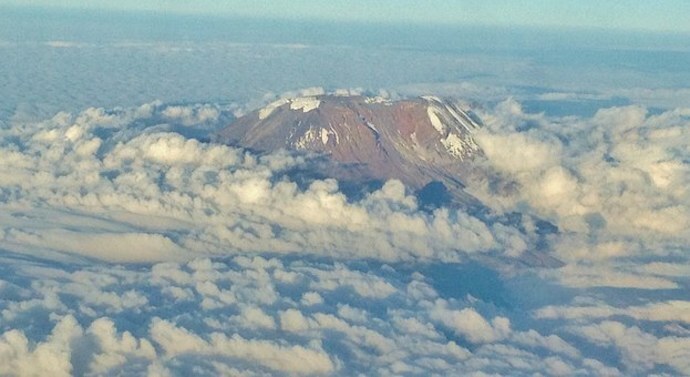 In terms of the tallest mountains in Africa, for most of us there is only one name that comes to mind: Mount Kilimanjaro. It’s easily the continent’s biggest mountain (not to mention stratovolcano), climbing up to 19,340 feet. Added to the credentials that deem it worthy of inclusion of this list, Kilimanjaro is also the tallest free-standing mountain on the planet. Because of its intimidating height, proximity to the equator, and isolated protrusion, Mount Kilimanjaro provides visitors with a dizzying array of climatic changes. Though it’s located a mere 3 degrees south of the equator on the border of Tanzania and Kenya, its peaks are permanently crusted in snow. Mount Kilimanjaro is one of the aforementioned Volcanic Seven Summits, as well as Africa’s representative in the Seven Summits. Allotting ample time for acclimatization, it takes about a week to reach the top of the mountain. The Rongai route is considered the easiest, for those just seeking credit. But the Machame route is said to offer the best views of the stunning East African landscape. The mountains of Ethiopia are perhaps best known as the birthplace of Coffea arabica (a.k.a. Arabian coffee), which is native to the forests of the southwestern highlands. There, the beloved plants once grew up to 40 feet in the wild, with beautiful white flowers and red or purple cherries. But the biggest mountain in Ethiopia is Ras Dashen, a mountain designated as the highest in the entire horn of Africa. The tale of the tape puts its height at nearly 15,000 feet. The mountain range in which it resides, the increasingly threatened Simien Mountains, (a UNESCO World Heritage Site) are famed for their rugged rockiness and severe ravines. The region’s array of wildlife, including Gelada Baboons, Walia Ibex, and the endangered Ethiopian Wolf (the rarest canid on the planet), is also worth noting. Ras Dashen, locally known as Ras Dejen, is the eastern peak of a huge volcano, much of which has been cut down by waters moving toward the Takkazzi River. Due to its height (and despite its vicinity to the equator), Ras Dashen is no stranger to snowfalls. But they tend to melt away quickly. While the views are dramatic and the area stunning, Ras Dashen does have a questionable reputation in terms of tourism. Reviews of trips here sometimes reflect discomfort over prices, odd financial interactions with guides and companies, and overcrowding. But, wow, what a dynamic landscape! Europe basically has two major mountain ranges that own the highest peaks in Europe list. The Caucasus Mountains, which extend from southeastern Europe into Asia, are home to all six of the tallest mountains on the European continent. Yet they wouldn’t even come close to competing for the top 20 biggest mountains in Asia. That said, the range’s tallest mountain has garnered a spot on the Seven Summits list. At 18,510 feet, Mount Elbrus (the tallest mountain in Russia) is officially the highest mountain in Europe. 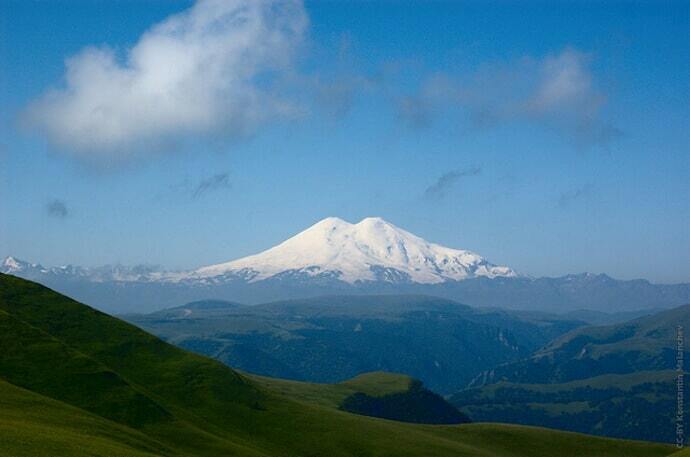 Elbrus is a dormant volcano with two summits, both of which are volcanic domes. But the western summit– the taller of the two– reaches roughly 60 feet higher than the eastern one. Oddly, several of the remaining highest peaks in Europe are found in the country of Georgia, which is technically located in Asia (if we’re using the Caucasus Mountains as the border). However, Georgia currently and culturally considers itself part of Europe. So let the debates begin! Europe’s second highest mountain range, which is located entirely on the continent, gets much more press and is widely believed to rank among the most picturesque mountains on the planet. The Alps are often fought over by two their parents, who prefer to distinguish the Swiss Alps and the French Alps. But there are also six other countries—Italy, Germany, Austria, Slovenia, Monaco, and Lichtenstein—that own a piece of the iconic mountains made famous by The Sound of Music. Mount Blanc (which is located on the French side) is the tallest mountain in the Alps, just passing a height of 15,775 feet. 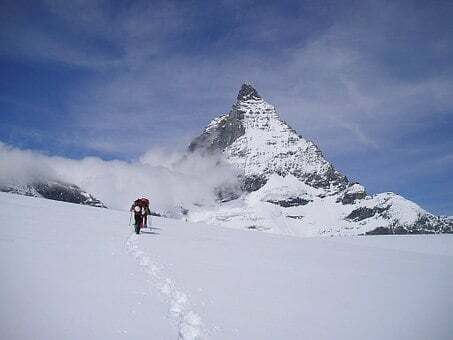 In Switzerland the highest peak is Monte Rosa, which stands at 15,203 feet. As for the rest of the range, there are dozens of mountains in the Alps that clear the 10,000-foot mark. Consequently, these hallowed hills have a huge effect the climate in Europe. While climbing is certainly a part of Alpine culture (and Switzerland’s Matterhorn is a notoriously deadly mountain for such activities), the Alps are most beloved as some of the best skiing mountains in the world, let alone Europe. Located just 750 miles from the South Pole, the most southerly of the Seven Summits tips the tape at a little over 16,000 feet and is the tallest mountain in Antarctica. 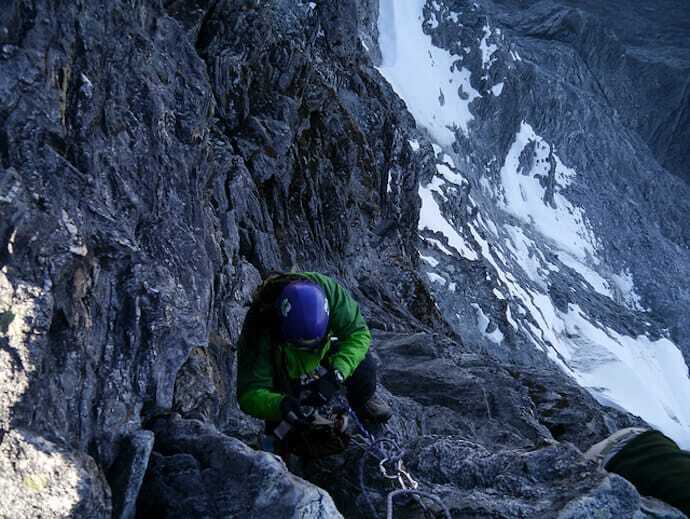 The Vinson Massif is by far the most remote of the mountains we’ve featured on this list. But that’s not to say that it can’t be summited. Tours are available for qualified and motivated climbers (assuming you have around $40,000 to spare). The Vinson Base Camp is best accessed by a flight from Punta Arenas in Chile. 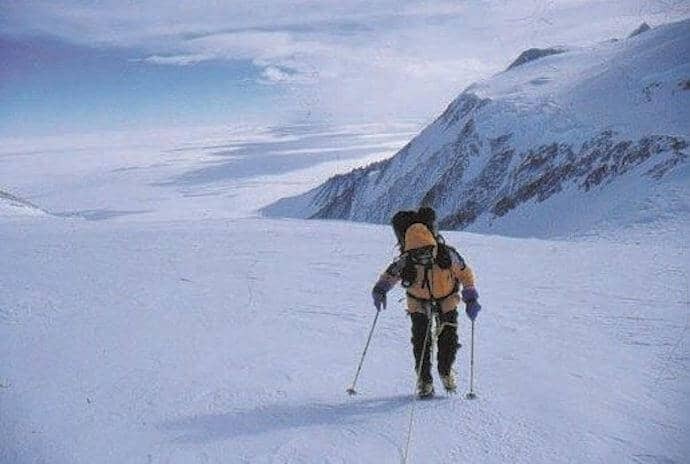 From there, climbers begin the upward trek over Branscomb Glacier to Vinson Massif. The summit provides a spectacular view of nearly untouched earth, with massive ice sheets stretching for miles below. Besides being the highest mountain on the continent, the Vinson Massif is huge, measuring eight miles wide and 13 miles long. This makes ascending it an easy climb, from a technical standpoint. But Antarctica being the coldest place on the planet obviously presents its own challenges, including constant ice. The highest peak in what is now referred to as Oceania (a.k.a. Australasia) is Puncak Jaya, which is located on the island of New Guinea. 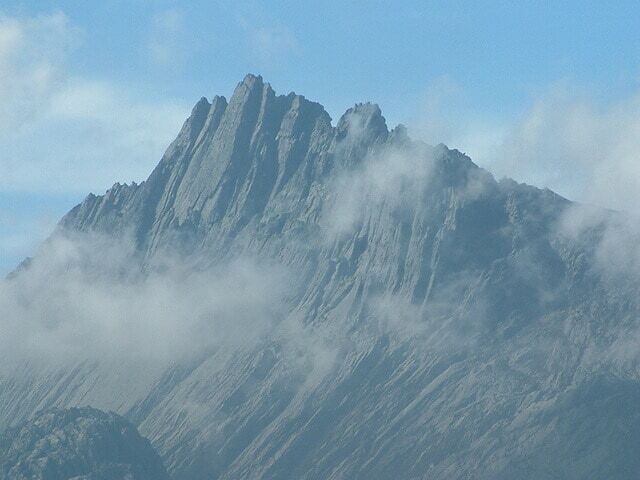 It is also known as Carstensz Pyramid. Puncak Jaya, though not as high as the majestic mountains of Asia, Africa, or the Americas, still climbs to an impressive 16,023 feet. And while it may be the shortest peak on our list of the tallest mountains in the world, it’s considered one of the illustrious Seven Summits. That said, its status on that list is currently in dispute because, technically, it’s on the western half of the island of New Guinea, in Papua. This region belongs to Indonesia, and is therefore not truly considered part of the Australian continent. As a result, some people claim that Mount Wilhelm– a 14,793-foot mountain in Papua New Guinea– is the rightful landform for the title of tallest mountain in Oceania. Whatever the case, this mountain represents the highest spot between the Himalayas of Asia and Andes of South America. Despite being equatorially located, Puncak Jaya does have several glaciers on its slopes. Aoraki (otherwise known as Mount Cook) is the tallest mountain in New Zealand. It’s located in Aoraki/Mount Cook National Park, where there are over 20 peaks that either near or exceed the 10,000-foot mark, as well as the longest glacier in New Zealand. The park is particularly renowned for its incredible stargazing opportunities. The park provides several huts on the mountain for skilled climbers to use. For those who are not quite so lofty in their goals, there are also luxury hotels with “barstool views” and secluded lodges. Tourist activities in the area include helicopter tours, skiing, glacier gliding, and mountaineering. However, be advised that the mountain does receive around 394 inches of rain each year. 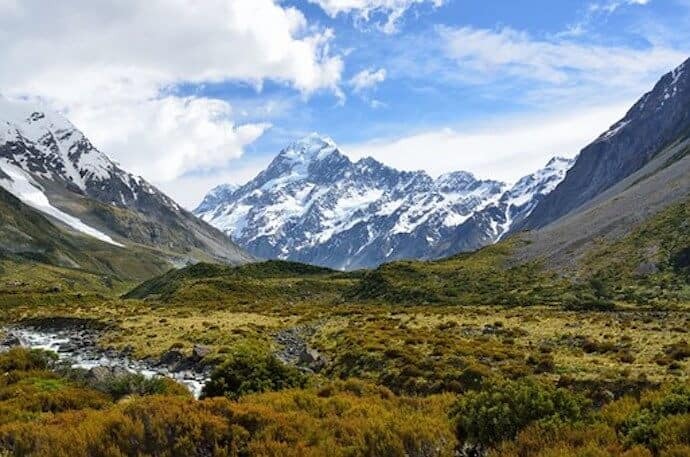 Together with three other parks– Westland National Park, Fiordland National Park, and Mount Aspiring National Park– Mount Cook has been deemed a UNESCO World Heritage Site. Mount Cook Village, which is located a few miles south of the mountain, is the base camp and tourist center for visiting climbers. Mount Kosciuszko tops out at 7,310 feet, just slightly edging out Mount Townsend for the honor. The mountain is the center point of a 1.6 million acre national park that has been designated a UNESCO Biosphere Reserve. 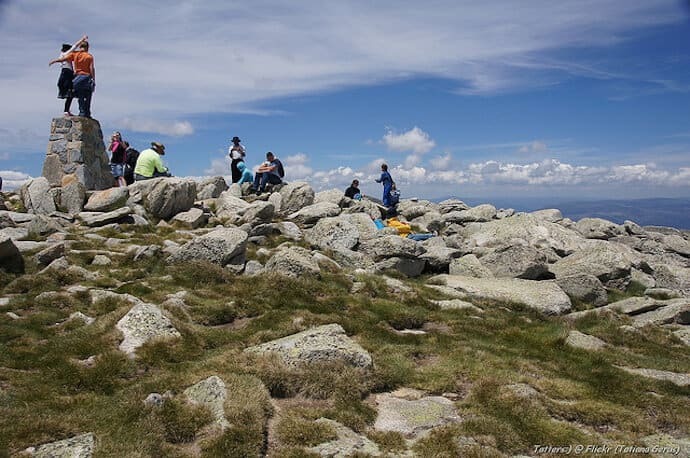 Kosciuszko National Park is the coldest and snowiest area in Australia, and the continent’s only spot with ski resorts. It’s also home to a treasure chest of unusual and endemic plants that are found nowhere else on the planet. The mountain was named by a Polish explorer (Count Pawel Edmund Strzelecki) after a Polish hero, General Thadeusz Kosciuszko. He fought in the American Revolution, and was a personal friend of George Washington and Thomas Jefferson. What is the tallest mountain in America? The tallest mountain in America (US) and all of North America is Denali (formerly known as Mount McKinley). 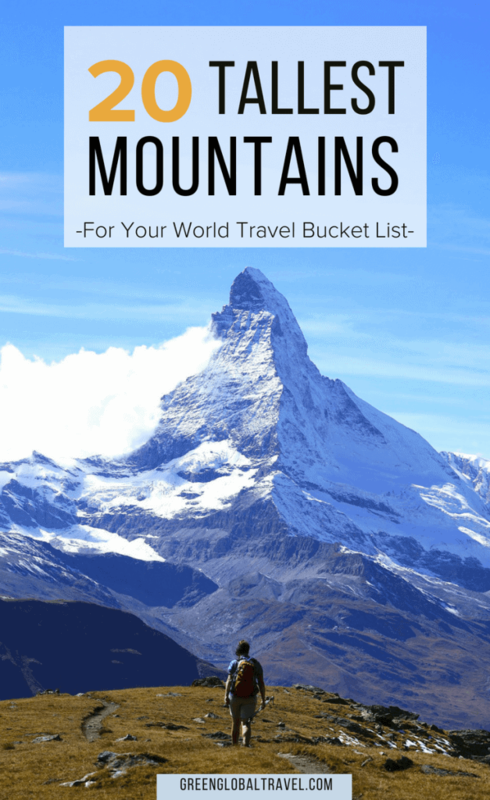 See Tallest Mountains in North America above for more details. At 14,440 feet, Mount Elbert is the tallest mountain in Colorado and the Rocky Mountains highest peak. What is the tallest mountain in California? Mount Whitney, with an elevation of 14,505 feet, is the tallest mountain in California and the tallest mountain in the lower 48 states. With an elevation of 12,637 feet, Humphreys Peak is the tallest mountain in Arizona. It is the tallest dorman volcanic peak in the San Francisco Peaks. What is the tallest mountain Utah? Kings Peak is the tallest mountain in Utah at 13,534 feet. King’s Peak is believed to be the hardest highpoint in Utah which can be climbed without a guide or rock climbing skills. What is the tallest mountain in Canada? The tallest mountain in Canada is Mount Logan. It has the biggest base circumference of any non-volcanic mountain on Earth and the second-highest peak (19,551 ft) in North America. What is the tallest mountain in the UK? Until recently, you’d find the tallest mountain in the UK in the Scottish Highlands. At 4,411 ft tall Ben Nevis is the tallest mountain in Scotland and up until two years ago was the highest peak in the British Isles. In 2017, the The British Antarctic Survey (BAS) determined that Mount Hope in the British Antarctic Territory, is Britain’s tallest mountain at 10,626 ft.
What is the tallest mountain in England? The tallest mountain in England is Scafell Pike at 3,208 feet above sea level. It has the unique feature of having highest standing water in England, known as Broad Crag Tarn. What is the tallest mountain in Germany? Located in Southern Bavaria, Zugspitze (9,718 feet) is the tallest mountain in Germany. It is also the highest peak of the Wetterstein Mountains and has three large glaciers. What is the tallest mountain in India? With an elevation of 28,169 feet, Kangchenjunga is the tallest mountain in India and the 3rd tallest mountain on earth. It is located on the border of India and Nepal and is part of the Himalayas mountain range.